Once again, business is war at Atari. The company announced their intent to go after the desktop publishing market with a Mega 4-based system priced in the $5,000 range--a price thousands of dollars below the competition. Atari made this announcement at the Corporate Electronic Publishing Show, (CEPS) in Chicago last April, a desktop publishing conference aimed at highlevel publishing professionals. It was Atari's first appearance yet at a vertical market show, and it raised more than a few eyebrows. In a booth on the prime floor space next to Apple and IBM, Atari promoted desktop publishing as a money-saving technology for ordinary computer users. Atari likes thinking of its system as the Honda of the desktop publishing world. "Jack likes to think of himself as a Japanese," says Atari Director of Software Development Joe Ferrari. "The Japanese take an American concept and improve it. At the high end, we'll pursue the typeshops to get their endorsement and then have a platform for less demanding users," Ferrari stated. "Then we'll pursue newsprint. In the corporate environment, they may want a Mac for the image and glamour, but small businesses and typeshops are bottom-line oriented. They won't allow emotions to interfere with hardware buying decisions." Atari Corp. is getting serious. They've hired a new president, Chuck Babbit; a new VP of Marketing, Anthony Gould; and a new public relations agency--Winston and Winston, of Fort Worth, Texas. They've printed up slick color brochures. But behind the new veneer, Atari's theme remains the same: "Power Without the Price." "We're going after the Mom and Pops of America," Gould said at a press luncheon on the first day of the show. "This is a low-cost solution for the cottage industries of America. If you're going to compete with Apple it's very tough," he said. Instead, Atari announced their intent to pursue the market that Apple has all but left to languish: "The rest of us." Atari's unofficial slogan for Gould's strategy is "Desktop Publishing for the Rest of Us"--an ironic twist on the old Apple Macintosh slogan, "Computers for the Rest of Us." 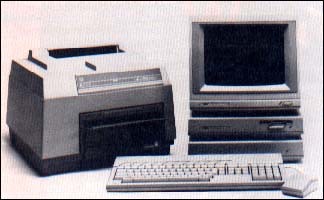 Atari's desktop publishing system for the rest of us is a Mega 4, the SH205 20-megabyte hard drive, SLM804 Laser Printer and Softlogik Publishing Partner Professional software. The entire package is priced at $5,492 retail. Atari says a comparable system would cost $6,892 on an IBM AT clone running Aldus Pagemaker and $9,092 on a Mac SE running Quark. Moreover, to make the Atari system even more attractive, Gould said Atari is planning to set up a financing plan enabling small businesses to buy the Mega 4 publishing system through leases for $80-$100 per month. But the response from Atari's competition was a resounding"So what?" The other participants at the show seemed to go out of their way to attack Atari probably because they couldn't accept Atari's low prices as "realistic" for the business computing market. Apple Corp. has all but ignored the idea behind the desktop publishing revolution: make typesetting and graphic design affordable to the masses. Instead, they were showing products that included a $35,000 four-color layout system without including the price of a Mac II computer. The offerings in the Apple booth were clearly aimed at the graphic design elite and that may have influenced the competition's attitude toward Atari. One expert who did take the Atari introduction seriously was Jonathan Seybold, publisher of the industry's most influential publication, the Seybold Report. Seybold was favorably impressed with Atari's software demonstration and intent to bring down the price of desktop publishing. "It's an interesting move I'll be watching them," he said. And as Atari's Babbit joked with reporters, "Give us your poor, your hardworking and huddled masses. We have the fastest-growing computer in Germany if not all of Europe. We need to keep that fire blazing in the U.S."
The spring Computer Dealers Exposition (Comdex) was held in Atlanta in May and Atari was there, although they showed nothing new in the way of hardware. Once again, Atari's display area was given over in large part to third-party developers with a theme of ST/Mega solutions to business problems. Atari confirmed their assault on the low-end desktop publishing market first announced at CEPS. Neil Harris, now Director of Product Management for the Computer Division of Atari U.S., explained that Atari would pursue those "niche markets" where it has already found success, such as the MIDI market. The mom-and-pop DTP market is the second of these on which Atari will focus its energies and money. Conspicuous by their absence from the Atari booth were the ABAQ transputer and the 68030 Unix box. Instead, Atari filled its booth with ST and Mega monochrome systems, with a lone PC4 80286 PC clone in the corner. The CDROM Player was shown (for the umpteenth time), but this time in its final production version. It should be in dealers' hands at the target price of $599 by the time you read this. Megabyte Computers of Webster, Texas announced their ST Accelerator board, a 68000-16 add-in board for the ST at Comdex. This is a hardware modification that requires the 68000 be removed from the motherboard. A new board, 68000-16 processor and faceplate switch must then be installed, but the results can be dramatic. Instead of crawling along at the usual 8-MHz clock speed, an Accelerator-equipped ST will charge along at 16 MHz! And it's designed to be switchable from inside an application merely by pushing a button on the computer's faceplate. The Accelerator's installation complexity means that not just anyone can do it; it requires a trained pro. Also, the computer's warranty will be absolutely voided. But the benefits may be worth the trouble and the risk. Look for the ST Accelerator in stores this summer at a price of $249. For the ST power user who needs super-fast math calculations, such as spreadsheets, CAD, graphics, etc., Xetec, Inc of Salina, Kansas has developed the XCEL hardware floating point math processor cartridge. It plugs into the ST cartridge port for math speed increases of 3-20 times! Xetec, Inc. should have received FCC approval for XCEL by the time you read this, so look for XCEL on the market at $199. You won't see any immediate improvement in off-the-shelf software using XCEL, since the application software must be recompiled using Xetec's custom math libraries, but software developers are very interested in supporting XCEL. Just what is going on here in the world of Atari? First a doubling of processor speed, then a math co-processor and now a video output board with a 19-inch high-res monochrome monitor! It's true--ISD showed it at Comdex. An off-the-shelf 19-inch high resolution Moniterm monitor was connected to a special video adapter card installed in the internal bus port of a Mega 4. And this was not just for demonstrations; ISD was showing off Calamus, their hot new DTP package, and DynaCAD, their next generation CAD package on the new monitor. The display was the equal of any DTP/CAD display at the show. Calamus and DynaCAD should be out this summer with the video board following in the second half of the year. Oh, and it can handle high-resolution color, also. Although not shown at Comdex, Atari's new 68030-based UNIX machine is on the bench in the R&D Labs at Atari, Inc.'s headquarters in Sunnyvale, California. The production prototype PC boards and the six custom Atari-designed chips are undergoing debugging. Everyone at Atari who spoke of this high-speed (16 MHz+ clock speed), high-powered machine was very excited about it. Its development seems to be proceeding on schedule and, since it is designed around an existing operating system (UNIX), a broad software base precedes it into the marketplace. It will be priced far above the home market (it was never aimed there in the first place), but at the lower end of the work station market and its success there will have a significant effect on Atari's future health. Have you been champing at the bit to buy the new TOS ROMs? Well, hold your horses, because Atari is not distributing the present version. But they are doing a major re-design of the ROM s and it is proceeding at full speed. According to Atari, the current Mega/ST ROMs were an interim re-design and bug fix and never intended to be the final version. They are shooting for a fall release of the new chips and they just may make it. The Blitter chip is still in such short supply that Atari is scrambling for enough chips to fill the sockets in its Mega computers. Atari recently changed fabricators for the blitter chip, however, and they still hope to have enough blitters to go around "soon." Atari has significantly changed their policy regarding public announcement of new products. Atari's past policy has been to announce products months (sometimes years) ahead of product shipments (if indeed shipping ever took place). This tended to make Atari--and Atari's spokesmen--look foolish. A new policy is now in place, however, that no new product will be announced before its availability is firmly established. That's why there have been no announcements of any of the products rumored to be under development at Atari. If the policy holds, it should do wonders to rebuild Atari's credibility both within and without the Atari community.